Hughes Bros.' Quality system meets or exceeds the requirements of Boeing D6-82479 Rev G BQMS and AS9100D. We possess the knowledge and have the inspection tools available in order to comply with the stringent requirements of today's industry. Complex inspections are done on our Faro Arm Edge Series portable coordinate measurement machine 0-8' with 2 sigma single point with .0012 accuracy. 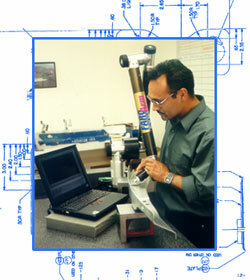 We possess the latest in digital accuracy for all inspection tools. Our capabilities include the ability to reverse engineer data to aid in the manufacture of tooling.